Located on the tip of the African continent, South Africa is famous for its diamond and gold mines and Jews have been a part of South Africa’s development from the very beginning. Today, South Africa's Jewish population stands at approximately 67,000 - the twelfth largest Jewish community in the world. Jews have been a part of South Africa’s development from the very beginning. Portuguese Jewish cartographers and scientists contributed to Vasco Da Gama’s discovery of the Cape of Good Hope in 1497. A number of non-professing Jews were among the first settlers of Cape Town in 1652, despite restrictions against the immigration of non-Christians. The earliest evidence of Jews in Capetown comes from a record of the baptism of two Jewish men living in the Western Cape on Christmas day in 1669. Until the early 1800s, only a few Jews came to South Africa as a part of the Dutch East India Company, which required that all its employees and colonists be Protestant. Religious freedom was granted by the Dutch colony in 1803 and guaranteed by the British in 1806. Among the first British settlers to come to Cape Town were 20 Jews. The first South African Jewish congregation was founded in 1841 when 17 men gathered to form a minyan at the home of Benjamin Norden, Helmsley Place. Eight years later, the first synagogue, Tikvat Israel ("Hope of Israel" - referring to the Cape of Good Hope) was established in Cape Town and is still standing today. Over the next three decades, British Jewish immigrants established additional synagogues, as well as cemeteries and other philanthropic institutions. Jewish immigrants from Germany and Holland arrived in Cape Town in the early 19th century seeking fortune and adventure. Some choose to join the Boers on their Great Trek into South Africa’s hinterland and some traveled into Rhodesia (present day Zimbabwe and Zambia). The Jews began building a commercial infrastructure for the Boer farmers and set up trading stations in villages and at railway sidings, which soon became local business centers. A credit system was established by the Jews to finance new industries. In the 1840's, Jews developed shipping, fishing and coastal trading and sugar enterprises. Jews were also active in the production of wine, clothing and steel. The discovery of diamonds in 1867 in Kimberly attracted Jewish entrepreneurs and businessman from all over the world. Because of the extensive Jewish trade network, Jews immediately became involved in the diamond and precious stones industry, many moving north from Cape Town to Johannesburg. Two famous Jewish South African entrepreneurs were Barney Barnato and Sammy Marks. Barnato founded the De Beers Consolidated Mines for mining diamond fields. In 1897, Barnato mysteriously died while sailing to England. Marks became involved in diamond trading and mining and, after amassing a huge fortune, he focused his attention on the Witwatersrand gold fields. Next, Marks became an industrialist and developed Transvaal; he planted fruit farms and forests, manufactured bricks, glass, steel and leather goods, exploited Transvaal’s coal and established the South African Breweries. 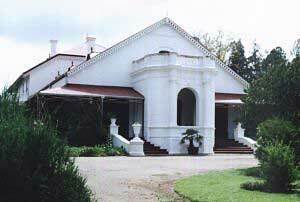 He also founded the town of Veeringing, along Transvaal’s border. Marks openly practiced Judaism and served as a mediator between the British and the Boers during the Boer-British Wars. Eventually Marks served as senator for the first Parliament in South Africa. The movement of Jews to Johannesburg caused Cape Town's Jewish community to shrink to only a few hundred families, who mostly assimilated and intermarried. However, between 1880 and 1910, the Jewish population swelled from 4,000 to 40,000 with Yiddish speaking immigrants from Lithuania, thus revitalizing the Jewish community of Cape Town. The new arrivals were fleeing political persecution and pogroms in Europe. South Africa became known as a Lithuanian colony. Many of the Eastern European immigrants discarded their old garb and mores and adopted new Anglo-Jewish customs. While many started out as peddlers, they eventually became shopkeepers. These new immigrants infused South Africa with a love of Israel and a strong Zionist connection. They were instrumental in the creation of the South African Zionist Federation in 1898, responsible for coordinating all the Zionist activities throughout the country. During the Boer War, Jews served on both sides, although the arrival of English Jews helped out the British side. Some Boers harbored prejudices against the Jews, while others felt a kinship toward them. In 1902, the British defeated the Boers and, in 1910, they formed four British South African colonies. The British gave the Jews equal status to the other white citizens, giving British authority legitimacy among Jews. Following the mining boom, Jews became part of the rapid industrialization of South Africa. They became involved in food processing; clothing, textile and furniture manufacturing; insurance; hotel management; advertising and entertainment. Jews also established supermarkets, department stores and discount store chains. The Jewish community of Cape Town formed its own community organization, the Cape Jewish Board of Deputies, and, a year later, a similar board was created for the Transvaal and Natal regions. In 1912, the two boards merged and became the South African Jewish Board of Deputies (SAJBD). Today the SAJBD represents nearly all of the Jewish community institutions and synagogues, works as a watchdog against anti-Semitic articles in the media, examines legislation concerning the Jewish community and maintains contact with diaspora communities world-wide, as well other political and religious organizations in South Africa. In 1903, attempts were made to restrict immigration; a strong Jewish lobby was able to influence legislation and Eastern European Jews were allowed to enter the country. Between 1920 and 1930, 20,000 Jewish immigrants arrived in South Africa. In 1930, increased feelings of anti-Semitism and the rise of Nazism in Germany sparked the passing of the Quota Act, which restricted immigration from Greece, Latvia, Lithuania, Poland, Russia, and Palestine. While not expressly stated, the aim of the Quota Act was to restrict Jewish immigration. Still, the quota excluded Jews from Germany and, by 1936, another 6,000 Jews fleeing Nazi Germany came to South Africa. The new German immigrants were integral in starting the Reform movement in South Africa, which was formally instituted by an American-born rabbi in 1933. 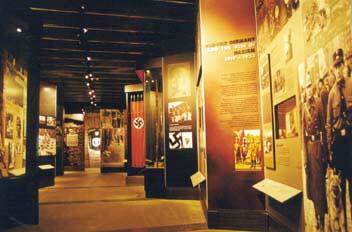 As Nazism further influenced militant and nationalistic Afrikaners, anti-Semitic organizations began to form. Another anti-immigration law, The Aliens Act, was passed in 1937, closing the doors to Jewish immigrants fleeing Nazi Germany. Further fear developed after the anti-Jewish National Party came to power in 1948. With the institutionalization of apartheid agenda, anti-Semitism was no longer a major issue. Many Jewish South Africans, both individuals and organizations, helped support the anti-apartheid movement. Most Jews, in fact, had actually voted against the apartheid National Party, casting their votes for either the Progressive Party or the United Party. One organization, the Union of Jewish Women, sought to alleviate the suffering of blacks through charitable projects and self-help schemes. Fourteen of the 23 whites involved in the 1956 Treason Trial were Jewish and all five whites of the seventeen members of the African National Congress who were arrested for anti-apartheid activities in 1963 were Jewish. Still, the Jewish Board of Deputies refused to take a stand against apartheid until 1985, arguing that it was not a Jewish one. The rabbinate also avoided taking a stance on the issue until the late 1980's. One of the great leaders of the anti-Apartheid movement, Nelson Mandela, wrote this about Jews in South Africas: “I have found Jews to be more broadminded than most whites on issues of race and politics, perhaps because they themselves have historically been victims of prejudice." Mandela's defence attorney, Isie Maisels, was Jewish. Jewish university students, in particular, vehemently opposed the apartheid movement. Jews, in fact, were largely represented in the percentage of white citizens who were arrested for anti-apartheid protests. A large proportion of Jews were also involved in organizations such as The Springbrook Legion, The Torch Commando, and the Black Sash. These anti-apartheid organizations led protests that were both active (ie. marching through the streets with torches) and passive (ie. standing silently in black). Other Jews sought to teach, train, and include black citizens in South African society. Ian Bernhardt lived in Johannesburg and led the Union of South African Artists in which he helped teach and protect black artists. Jews could be found in the majority of anti-apartheid organizations and protests throughout the apartheid regime. Israel maintained diplomatic relations with South Africa throughout the period, as did most Arab countries, Taiwan, Belgium, and Britain. Despite the arms embargo, these countries sold arms to South Africa during the apartheid era. There have even been reports of nuclear cooperation. Various Israeli leaders publicly condemned the apartheid system. During the early 1960's, Israel aligned with other African countries against the apartheid system, straining its relationship with South Africa. After the Six-Day War in 1967, most African countries broke diplomatic ties with Israel, except for South Africa, and this led to increased relations between the two. Violence in South Africa during the 1970's led to an exodus of many white citizens, including Jews, who were fearful of their future in the country. Many children were sent to live and study abroad and remained in their host countries. Two Jewish organizations were formed in 1985: Jews for Justice (in Cape Town) and Jews for Social Justice (in Johannesburg) tried to reform South African society and build bridges between the white and black communities. Also in 1985, the South African Jewish Board passed a resolution rejecting apartheid. Jews prospered during the apartheid era, as did many non-Jewish white citizens. The Jewish population, however, contained a higher than usual percentage of college graduates. More than 50 percent of the Jews were matriculated, compared to the average 23% in the total white population. Ten percent of the Jewish community had university degrees, compared to only 4% of the total white population. Jews were disproportionately represented in the commercial and financial sectors of society. The Jewish population peaked in the early 1970's reaching nearly 119,000 people. Between 1970 and 1992, more than 39,000 Jews left South Africa, during this same period approximately 10,000 Israelis moved into the country. The Jewish community welcomed President De Klerk’s rise to power in 1990 and his decision to dismantle apartheid. Jews stood firmly behind the negotiation process and the first democratic election in 1994. The country’s new Bill of Rights gave complete freedom of religion. While supportive of the new regime, many Jews worry about the future of the Jewish community in South Africa. Concerns included the freedom to practice a full Jewish life individually and collectively, the right to pursue Zionist activities and the continuation of relations between South Africa and Israel. In 1995, the Truth and Reconciliation Commission was established to investigate crimes committed under apartheid. The first Jewish organization to contribute to the Commission was Gesher, a Jewish social action group based in Johannesburg. In the commission’s first report, religious communities (including the Jewish community) were censured for their lack of action against the apartheid regime. Individual and group efforts made by the Jews to fight for justice were noted in the report. A visit by former South African President Nelson Mandela to Israel in October 1999 marked a process of reconciliation between the two. Because of Israel’s relations with the apartheid regime, Mandela had been critical of Israel in the past. Israelis had also been critical of Mandela because of his relationship with Yasser Arafat and support for the Palestinians. Prior to the second half of 2003, the Jewish community in South Africa were in a state of transition. Approximately 1,800 Jews left the country every year, primarily due to concerns about crime and the economy. South Africa had the highest violent crime rate in the world, about ten times that of the United States; residences in the middle of cities were often surrounded by electrified ten-foot-high walls topped with barbed wire. The prevalence of crime, and the consequent economic woes, led to the depletion of the Jewish "viable middle," the young and middle aged adults who are needed to sustain the community. Many members of the disproportionately aged population, whose children have left, face problems as they grow ill, as government welfare subsidies have decreased sharply. Despite the economic and demographic woes, however, the South African communities remained mostly optimistic. The Jewish population is very religious, 80 percent Orthodox and rising. This increase in religiosity has been attributed to a desire for stability in an otherwise unstable society. Anti-Semitism is negligible, and the intermarriage rate is only 7 percent. Many of the Jews who remain in the country do so out of the conviction that post-apartheid South Africa needs their support, and will soon pay social and economic dividends; of course, the rest of those who remain do so simply because they cannot afford to leave. Since the latter half of 2003, South Africa's community of 75,000-80,000 Jews has largely stabilized. South Africa's relations with Israel have been touchy in large part because of anger over Israel's involvement with the old regime, and because the African National Congress that has held power since the end of apartheid, had close ties to the PLO and sympathized with the Palestinian cause. More recently, South African officials have also supported the anti-Semitic boycott, divestment and sanctions (BDS) movement aimed at isolating Israel. One of those officials, Minister of Higher Education and Training Blade Nzimande, was denied a visa in April 2015 because of his support for BDS and his intention to meet only with Palestinian officials and snub the Israelis. South Africa’s Jewish population is mainly found in five urban centers: Johannesburg, Cape Town, Pretoria, Durban and Port Elisabeth. The Jewish community of South Africa is run by a number of institutions. The South African Jewish Board of Deputies takes care of political matters. The United Communal Fund-Israel United Appeal (IUA-UCF), is that major fundraising body. The Union of Orthodox Synagogues (UOS) serves as the umbrella body for all of the Orthodox synagogues across the country, maintains the office of the Chief Rabbi, the Johannesburg and the Cape Town Bet Dins. Another coordinating body is the South African Union for Progressive Judaism, which organizes events for the Reform congregations of South Africa. The Jewish educational system is run by the South African Board of Jewish Education (SABJE). Over 80 percent of Jewish children are enrolled in the Jewish day school system. The South African Zionist Federation serves as the umbrella organization to all South African Zionist organizations. South Africa was home to many famous Jewish personalities. Henry Gluckman served as the only Jewish cabinet member in 1945. Harry Schwartz was South Africa’s first Jewish ambassador to the U.S. Helen Suzman was the only women in Parliament for many years and also the sole representative of the liberal Progressive Party and a vigorous opponent of apartheid. Jews have lived in Cape Town since its creation and the population has grown from about 20 Jews in 1820 to more than 17,000 members today (down from a high of 25,000 in the 1980's), constituting more than 25 percent of the Jewish community in South Africa. In 1841, the Cape Town Hebrew Congregation was founded a week after 17 Jewish males conducted the first Orthodox Service in South Africa. The first services were held on September 26, 1841, at a private home, Helmsley Place, which today forms part of the Mount Nelson Hotel complex. Eight years later, the first Synagogue was established next to Parliament and Reverend Isaac Pulver was the first Spiritual Leader. By 1863, the Congregation had grown to the point where a new building was needed, it was constructed on what is today the Jewish Museum complex. In 1905, a still larger building was required and the present Great Synagogue (Gardens Shul) was constructed alongside the Old Shul. Cape Town had its first Jewish Mayor that year, who was also the president of the Congregation — Hyman Liberman. The Rev Alfred Bender had arrived to lead the Shul in 1895, and served as their Rabbi for 42 years. The Cape Town Jewish community is fairly homogenous. Approximately 80 percent of the Jewish community is of Lithuanian descent. The same percentage is Orthodox, while the other 20 percent are Reform. There are 12 Orthodox synagogues in Cape Town and two Reform synagogues. The Great Synagogue, Gardens Shul, or Cape Town Hebrew Congregation, which was consecrated in 1905, is the oldest active congregation in South Africa and is located just to the right of the first synagogue and now, the Jewish museum. The Gardens Shul is an “Egyptian-revival-style house of worship” that currently seats over 1,400. 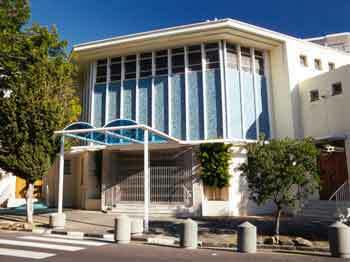 In addition to the Great Shul, other Orthodox synagogues include the Green and Sea Point Hebrew Congregation, which has more than 2,000 members, and is the largest synagogue in all of Africa, and the Claremont synagogue. There are also a couple small Lubavitch and Sephardic synagogues. While the majority of Cape Town Jews belong to Orthodox synagogues, most are not strictly observant. Nearly 80 percent of Cape Town’s Jewish children are enrolled in Jewish day schools, which run from primary school to high school. Cape Town has the Herzlia school, catering to grades first through 12th and three other primary day schools; most of which are Orthodox. The Holocaust and Zionism are central to South African Jewish identity. The community successfully lobbied the government to require Holocaust education in all public schools and recently built the Cape Town Holocaust Centre, the only Holocaust institution in Africa. A siren was sounded from the Jewish community center on Holocaust Remembrance day last year and was broadcast throughout the country. Even the parliament observed a moment of silence. Jews express their Zionism through philanthropy. The Cape Town Jewish community donates more to Israel per capita than any other Jewish community in the world. While the majority of the Cape Town population disapproves of Zionism, this generally does not affect attitudes towards Jews. In fact, many Jews have strong relationships with the local government. Prominent political figures often appear at Jewish events, despite their criticism of Israel. The Cape Town Jewish community is not completely immune to violence and anti-Semitism. In 1997 gasoline bombs were thrown at the home of community members and, in December 1999, a bomb was thrown at one of Cape Town’s synagogues. Fortunately no one was injured in either attack. * The Jewish Museum: Located in Cape Town’s oldest synagogue, Tikvat Israel; the Museum contains a collection of ceremonial objects belonging to the original community members. * The Mendelsohn Library: Located in South Africa’s Parliament’s Library, the library consists of the private collections, books and artwork, of Sidney Mendelsohn, an English born Jew. * Lieberman Doors: Hyman Lieberman was Cape Town’s first Jewish mayor. He donated these doors depicting biblical scenes to the African National Gallery. The Gallery also houses the private collection of de Pass family, another well-known South African Jewish family. * Helmsley Hotel: Site of the home of Benjamin Norden, which housed South Africa’s first Jewish congregation in1841. *Kaplan Center: Located in the University of Cape Town, the Center has a collection of photographs of South African Jewish history. * Cape Town Holocaust Center: It is the only Holocaust Center established in Africa and works to combat anti-Semitism, as well as all other forms of discrimination and prejudice. The museum compares early Nazi Germany to the apartheid government and explains the Holocaust through the framework of racial injustice. *Gitlin Library: Housed in the Holocaust Center, the Gitlin Library holds 20,000 Jewish-themed Hebrew, Yiddish, and English books and periodicals, photographs, DVD's, CD's, videos and cassettes. * Zaandwijk Winery, located right outside Cape Town, is the only kosher winery in South Africa. Nine year’s after its establishment in 1886, 6,000 Jews lived in Johannesburg. Jewish immigrants hailed from Britain, Germany and Eastern European Jews, mainly from the Baltics and Russia. Many came in search of wealth in the gold fields. Both the Witwatersrand Goldfields Jewish Association and the Witerwatersrand Old Hebrew Congregation were founded in 1887. 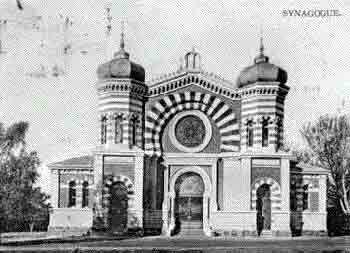 The former bought two plots of land for the first synagogue in Transvaal, which later became known as the President Streets Synagogue. Mendelssohn served as its first president, as well as its chairman during various periods. Four years later, President Paul Kruger of South Africa dedicated the Park Synagogue to the Johannesburg Hebrew Congregation. Another synagogue, the Great Synagogue, opened in 1914; the Great Synagogue is modeled after Istanbul’s Hagia Sophia mosque. Johannesburg’s other major synagogue, the Mooi Street Synagogue, founded by Lithuanian immigrants, has recently been declared a national landmark. During the late 1800's and early 1990's, many of Johannesburg’s Jewish institutions were created. Charitable organizations, such as the Hevra Kadisha (burial society), a Jewish soup kitchen, Jewish Ambulance Corps, Bikkur Holim Society and a Jewish Ladies Benevolent Society, were formed to take care of the new immigrants and the poor members of the community. A Jewish Hospital was built in 1896 to administer to Orthodox Jews who insisted on kosher food and who felt more comfortable with Jewish doctors and nurses. Eventually the Jewish Hospital became part of the Johannesburg General Hospital and, today, it still offers kosher meals. Social clubs were also founded in this period, including a Jewish Dramatic Society and the Jewish Guild. Johannesburg’s first Jewish school opened in 1890 and served as a forerunner to the National Jewish Day School movement. Jewish education transformed over the years and is rarely carried out by the traditional cheders (one-room classes). Johannesburg is home to many Jewish institutions and organizations, including the Jewish Board of Deputies, a Jewish library and a Jewish museum, which contains African-sculpted stones mezuzas, two Torahs from Maputo (found in Mozambique) and other interesting memorabilia from the South African Jewish community. During South Africa's dark apartheid period, a building boom crowded the city with cheap shoddy apartments and poor black people from the suburbs looking for work. These individuals were exploited by landlords and eventually grew frustrated and began to settle illegally in the more affluent areas of the city, causing an urban decline and an exodus of the European immigrants who had settled in the area during the 1960's and 70's. This exodus included most of inner city Johannesburg's Jewish population and forced many of the historic synagogues to shut their doors or move to a different location near where their congregants were moving. The Great Synagogue in downtown has moved four miles from it's original location and shut down in 1994. It now serves as a Church, but there are still remnants of the Jewish structure including a Star of David on top of the building's dome and a message etched in stone on a building across the street that reads "Hebrew High School". Temple Israel in the Hillbrow neighborhood and the Lion's Shul in Doornfontein still open their doors for prayers on a weekly basis, although they do not get nearly as many congregants as they used to and are low on funds. Temple Israel cannot afford to employ a Rabbi full time and it is in an inconvenient location for most of their worshippers, as they stayed in the city and did not move their synagogue after the white exodus in the 1980's and 90's. 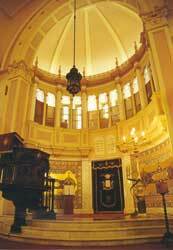 The Doornfontein synagogue also known as the Lion's Shul is the oldest still functioning synagogue in Johannesburg. Completed in 1905, the synagogue recieved it's informal name from the two lion statues at the front entrance. Currently the synagogue is run by Rabbi Ilan Herman and none of the congregants live in the surrounding neighborhood. Even Orthodox members of Herman's congregation drive to the synagogue for Shabbat services. In the suburbs of Johannesburg, one can find the Johannesburg Bet Din and the Etz Chayim Synagogue, which houses a Holocaust memorial. Another Holocaust-related site is a sculpture found at the entrance to the Westpark Cemetery. Created by artist Herman Wald, it features thee hands, each holding a shofar and the three shofars spiral inwards. Today, Johannesburg has a Jewish population of approximately 50,000 people, the largest in all of South Africa. Pretoria has a small Jewish population, numbering about 3,000 people. Jews have lived in Pretoria since the founding of the city in 1867 and have played a major role in its industrial and commercial development. De Vries, the first Jewish settler in Pretoria, became a prominent member of the city; he became state prosecutor, member of the Volksraad and was a pioneer of the Afrikaans language. Other Jewish settlers from Lithuania were not as educated as de Vries; many only spoke Yiddish and opened small shops. The Jews of Pretoria tried to remain neutral during the Anglo-Boer wars, although some volunteered for the ZAR forces. The Pretoria Hebrew community was founded between 1890 and 1895. The community’s first synagogue was inaugurated in 1898 on Paul Kruger Street and a second synagogue, the Great Synagogue, was opened in 1922. Neither the old (Paul Kruger Street), nor the new (Great Synagogue) are still in use. A Reform synagogue, Temple Menorah, opened in the early 1950's. In 1952, the Paul Kruger synagogue was expropriated by the government for the purpose of erecting a new Supreme Court, which was used for security-related cases, the activities of the black opposition movements and socialist/communist alliances. From August 1, 1958, to March 29, 1961, the treason trial of Nelson Mandela, Walter Sisulu and 26 others was held at the Old Synagogue. On March 29, 1961, all the accused were acquitted. From October 22 to November 7, 1962, Mandela was again on trial in the Old Synagogue. On November 7, Mandela was sentenced to a total of five years in prison with hard labor, three years for incitement to strike and two for leaving the country without travel documents. In 1963, while serving the sentence handed down in the Old Synagogue, Mandela appeared at the Rivonia Trial. From November 14 to December 2, 1977, the inquest into the death of Steve Biko was held in the Old Synagogue." The Miriam Marks school, established in 1905 and the Carmel School, opened in 1959, are the two main Jewish educational institutions in Pretoria. The Carmel School is the only one still open; the school also serves as the only functioning synagogue. Currently, the reform congregation shares its rabbi with Johannesburg and the synagogue is also no longer in use; today services are held in the homes of community members. The Pretoria Jewish community was at its height during the early 19th century. There were many Jewish sporting clubs, charitable organizations and youth groups. However, after 1948, many Jews left Pretoria for Cape Town and Johannesburg. There are some interesting Jewish sites in Pretoria, including the "Barnato Lions" - marble lions donated by Sammy Marks to Paul Kruger and the home of Sammy Marks, which is currently a museum.